Always running and used on a daily basis, your fridge is built to last. Even so, some easy mistakes can compromise its functions and lead to a leak. 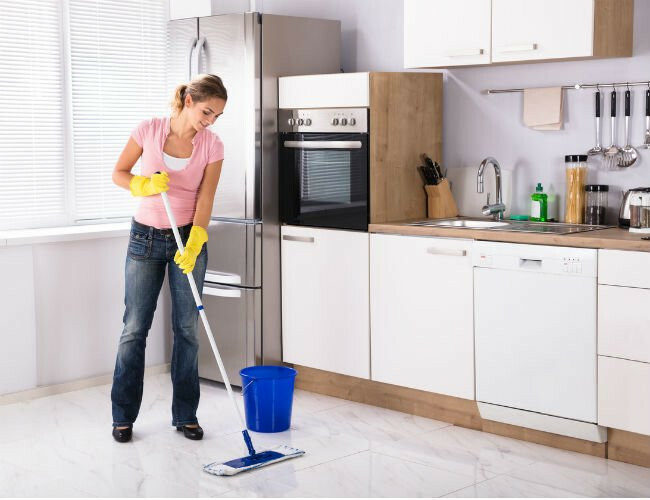 If you notice water on your kitchen floor, keep reading for common causes and (mostly) easy fixes. Q: There’s a small daily puddle on my kitchen floor that seems to be coming from my refrigerator—not from anything inside, but from the fridge itself. Why is my refrigerator leaking water? And do I have to call in a repair tech? A: Sounds like you’ve got a small mess on your hands! You could be dealing with a number of issues, but it’s probably one of four common scenarios, all of which you can remedy yourself without calling for backup. So, let’s run through the likeliest possibilities and see which one’s wreaking havoc in your kitchen. First, check to see if the fridge is level. If you’ve just purchased your refrigerator, moved into a new home, or recently remodeled your kitchen floors, there’s a good chance that simply moving the appliance has caused it to start leaking water. Now, a fridge isn’t meant to be perfectly level; in fact, the front actually needs to stand somewhere between a quarter-inch and half-inch taller than the back—this slight front-to-back tilt enables coolant (the liquid responsible for keeping the appliance chill) to flow freely. When coolant can’t easily circulate, it may pool in the pipes and force the fridge to work harder than necessary to pump it; this creates extra condensation around the coils that may end up dripping water on the floor, which could look as though your refrigerator is leaking. Place a level on the floor of your fridge (not a shelf, which might be uneven on its own) to confirm that it’s even-keeled from side to side. Then turn the level so that it runs front to back in order to verify that the appliance stands just slightly higher in the front. If you need to do some adjusting, remove the grill from the front bottom of the fridge and adjust the legs or rollers according to instructions provided in your owner’s manual. Depending on the model, this may require a wrench or screwdriver. Aim for a ¼ to ½ inch rise in the front, and check the level again. Be prepared to phone a friend in case the back legs or rollers need adjusting, too, since that will involve unplugging and pulling the fridge away from the wall to do so. Inspect your defrost drain for a blockage. When the defrost drain (accessible at the back of the freezer on most refrigerators) is blocked—whether it be by a food particle, a stack of frozen dinners, ice, or some combination—your appliance has to work overtime again. Cue the condensation collecting on the coils and, soon, water dripping onto the floor just like in the scenario of an improperly leveled fridge. Unclogging the drain then should eliminate the leak. Open the freezer and look to see that nothing blocks the defrost drain along the back wall. If it’s obstructed by items in the freezer, simply move things around until air can flow freely, and then give it a day or two to see if the issue’s been solved. If puddles persist, the clog may be something smaller: crumbs or ice. In either of these cases, you’ll need to transfer your food from the fridge and freezer to a mini fridge or freezer chest and unplug your main model from the wall. Next, remove the plastic plate over the drain hole (your appliance manual may have tips for this) and use a turkey baster or funnel to flush warm water down the defrost drain. This should clear the drain of debris and allow your unit to function normally once more. Check your water supply lines. If your fridge is level and your drain is unobstructed but you’re still seeing a daily puddle, the problem might lie with your water supply line. (Other signs that point to a problematic water line: Wonky ice production and slow water flow on command at the fridge door.) Here, too, you’ll need to unplug the fridge to inspect further, so prepare by setting your perishables somewhere safe for the time being. Pull it out from the wall, and eyeball the plastic hose that runs from your ice maker and water filter down the back of the appliance. If you see water dripping or collecting along the exterior of the hose, you’ve got a leak. The choice is yours: You can call in a repair technician or, if you’re confident in your ability to complete the task at hand, order a new hose and swap it in yourself. The latter involves turning off the shutoff valve to the water supply, which you’ll find either underneath the sink closest to the fridge or in your basement, and replacing the hose following your manufacturer’s instructions. Just be sure to tighten the connections on both ends when you’re through to avoid another instance of your refrigerator leaking water. Finally, check your drain pan. Though it’s the least likely of the possibilities we’re listing, this due diligence may save you a hefty bill from a fridge technician. Look under your fridge and pull out the plastic drain pan housed underneath it. It’s normal for there to be a small amount of water inside the pan, which should evaporate eventually under the condenser fan housed nearby. But, if you can see that the water has escaped the pan and pooled onto the floor due to a crack, warp, or another form of damage, then get yourself to your local hardware store to replace it. Voilà! Problem solved without the help (and expense) of a pro.